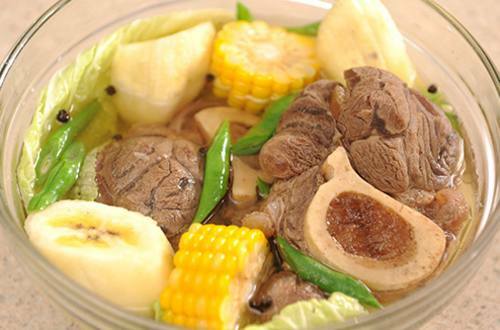 Soft tender meat slow cooked in a flavourful broth made with corn, saba banana, pechay and Knorr Beef cubes. Now, that's lunch! 1 Begin by getting a pot and fill it with water. Let the water boil together with the beef shanks and onions. Cook until beef is tender. 2 Now drop in the Knorr Beef Cubes, corn and saba. 3 Mix in Baguio beans and pechay and just simmer for a minute. 4 Give this soup a nice seasoning of pepper and that's our dish! Just like mom, a big serving of Bulalo is enough to fill your day with good thoughts and warm hugs.